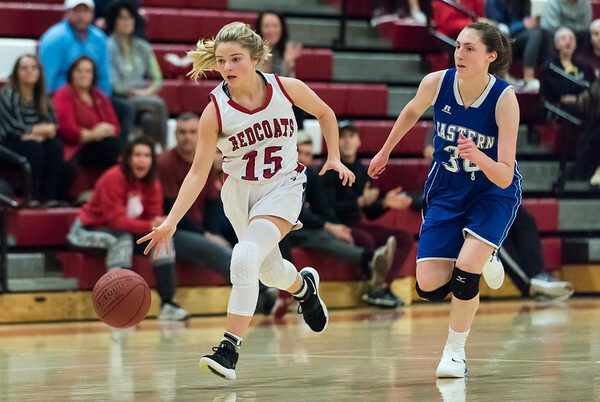 BERLIN - Coming off its first loss since, Jan. 15, the Berlin girls basketball team wanted to get back on track in a hurry, and lay the groundwork for a new winning streak after its four-game win streak was snapped on Monday in Newington. One night later, the Redcoats are back in the win column. Berlin stormed out to a 12-point lead at the end of the first quarter and never slowed down, rolling over Bristol Central for a 58-20 win at home. A consistent Redcoats defense allowed just 10 points in each half, while Carly Grega led the offense with 16 points. Ashley Wenzel added 12, while Wenzel, Grega and Ani LaPointe all knocked down a pair of 3-pointers each to pace the offensive attack. Prince Tech 62, Goodwin Tech 43: The Gladiators had no answer for Prince Tech’s Nyah Jenkins, who finished with 27 points in a 62-43 rout for the Falcons. Prince Tech scored 59 of its 62 points through the first three quarters and held a 40-point lead heading into the final period. Joarielys Martinez led Goodwin Tech with 22 points, while Justina Rodriguez added seven. The loss snapped a two-game winning streak for the Gladiators. Middletown 99, Plainville 82: Chris Zagorski knew his team was going to be in for a tough meet Tuesday afternoon. Individually, Plainville came through with a number of first place finishes. Joe Michalic was a double winner for the Blue Devils, taking both the 100 and 200 freestyles. Nate Lyman placed first in the 100 butterfly with Matt Lagassey winning the 100 breaststroke. The 400 freestyle relay of Michalic, Marcos Gutierrez, Brandon Paznokas and Lyman took first in that event. Also swimming well for Plainville was Colin Blake, Justin Niziolek, Jake Molloy and Guttierrez, while Zach Dery got a personal best in the diving portion of the meet. The Blue Devils will next take on Windsor Friday afternoon at home. Bristol Central: Oliva Darby 0-2-2, Gwen Taresso 2-2-6, Ella Watson 1-3-2, Ashley Watson 3-0-6, Lani Mar 1-2-4. Totals 7-6-20. Berlin: Lyzi Litwinko 4-1-9, Ashley Wenzel 4-3-12, Arianna Hender 1-1-3, Angela Perrelli 2-1-5, Carly Grega 7-0-16, Rilee Cop 0-1-1, Clare McGeever 1-3-5, Ani Lapointe 2-0-6, Callie Gendron 1-0-2. Totals 22-9-58. 3-Point Goals: Wenzel (B) 2, Grega (B) 2, LaPoint (B) 2. Records: Berlin 14-4, Bristol Central 2-15. Posted in New Britain Herald, Berlin, Goodwin Tech, Plainville on Tuesday, 5 February 2019 21:18. Updated: Wednesday, 6 February 2019 11:29.